On the west shore of Hudson Bay, Churchill is the polar bear capital of the world. Not only are bears and belugas plentiful, but set against the illuminating backdrop of the Northern Lights, the setting is truly awe-inspiring and unlike anything else you’ll find in Canada. The mystical Aurora Borealis shows up in the night sky at Churchill an average of 300 nights a year. Its location under the aurora oval makes it one of the best places on earth to view the Northern Lights. Those who make the effort to venture to this Northern Manitoba town are richly rewarded for their efforts. This bucket-list trip of a lifetime brings you to Hudson Bay where curious beluga whales play in the shallow waters under the dazzling Northern Lights and polar bears roam the shoreline in search of their next meal. We know the best time to plan your trip to witness these Lords of the Arctic - they congregate here for only a few weeks each year as they wait for the ice to form on Hudson Bay. Once the ice is stable enough, the bears leave and spend the winter hunting seals and the viewing season is over until next year. You’ll have a safe front row seat to witness these massive Arctic predators from high atop your Tundra Buggy. Photographing white on white can be tricky and our knowledgeable Insiders will have lots of tips to help you bring home the perfect shot. When you’re in the polar bear capital of the world, there are just two rules: always have your camera ready, and never turn your back on a bear. 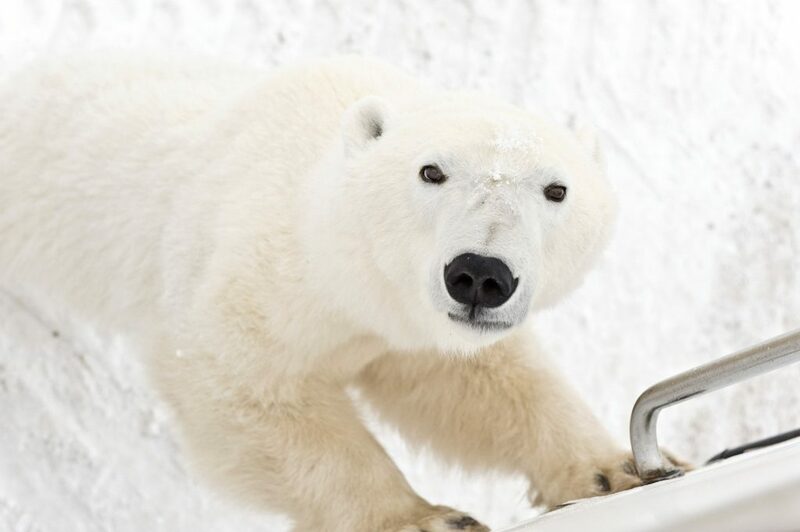 The Inuit culture calls polar bears ‘Nanuks’ meaning “animal worthy of great respect”. As you watch these thousand-pound predators patrol their habitat, you’ll gain enormous respect for them too.